Poaching is one of the most popular methods for cooking eggs. 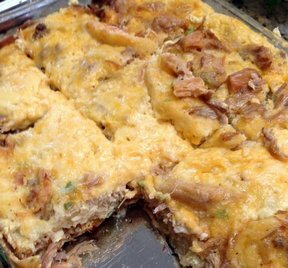 It's quick and easy and results in an egg that is tender and delicious. 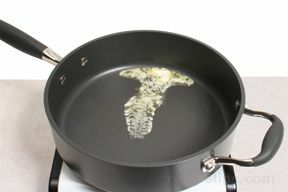 The poaching method is one in which an egg, without the shell, is cooked in simmering water in a pan on the stovetop. Unlike a boiled or coddled egg in which the best results occur when using an older egg, a poached egg is best when a very fresh egg is used. This is because when a fresh egg is placed into the heated water, it will not spread out as readily as an older egg, resulting in a cooked egg with a more pleasing shape and texture. 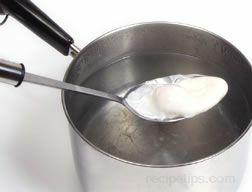 If an older egg must be used, it can be simmered (in the shell) in the poaching liquid for a few seconds in order to slightly congeal the egg white; then when the egg is broken to release the contents into the poaching water, it will not spread out as much as it normally would. One tablespoon of vinegar added to the water will also help in coagulating the white quickly so that it will not spread excessively in the water. The following steps can be used for poaching eggs on the stovetop. Begin the poaching process by piercing the large end of the eggs with a pin. 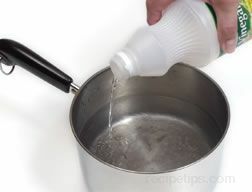 Add cold water to a large saucepan and bring the water to a boil. If you are using eggs that are not completely fresh, use a slotted spoon to lower the eggs into the boiling water, but do not leave the eggs in the water for more than 10 seconds. This short precooking time helps to set the egg whites just enough so that the whites do not spread out too much when the eggs are poached. 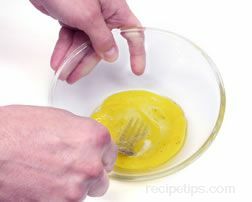 Add 1 tablespoon of vinegar to the boiling water; then lower the heat so that the water is reduced to a simmer. It is best to open the eggshell as close to the surface of the simmering water as possible. This will prevent the eggs from spreading excessively in the water. The poaching process should be timed for about 4 minutes; however, the time may vary depending on the size and age of the eggs. When the cooking time is complete, remove the eggs from the water with a large slotted spoon in the order to drain as much water from the eggs as possible. It is important to remove the eggs in the same order in which they entered the water. This allows the last egg to be cooked for the same amount of time as the first. The eggs can be bathed in warm water to remove any trace of the vinegar (if vinegar was used in the poaching water). The egg white should be firm, but the yolk should remain in a liquid form. 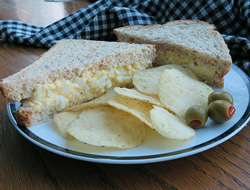 If there are any streamers of egg white extending out from the main portion of the egg, they can be trimmed off before serving. Eat poached eggs as is or include them in your favorite recipes. 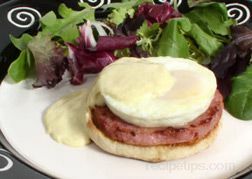 Another method for poaching eggs on the stovetop involves the use of a metal egg poaching form that makes the process almost foolproof. 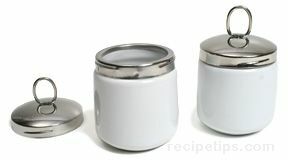 The metal form is a shallow slotted oval container with an attached handle. The egg is broken into the form which is then lowered into simmering water. The metal form or poacher is convenient to use and creates a pleasing shape. 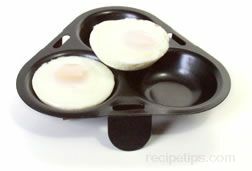 Using fresh eggs or older eggs is not a concern when using the metal poacher. 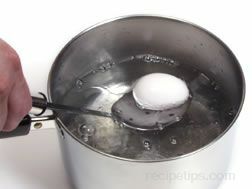 Regardless of how the eggs are poached, the water should be at a simmer and not a full boil. If metal poaching tools are used, several can be placed in the pan at one time. 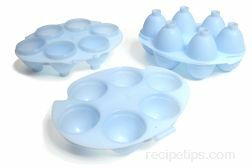 If the forms are not used, several eggs can also be poached at one time, but more care must be taken when breaking the eggs over the water so that each egg has its own space within the pan. 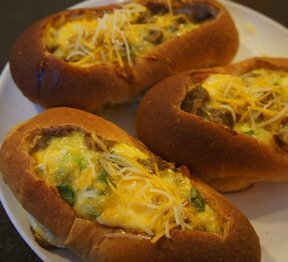 Poaching can also be accomplished in a microwave. If eggs are to be poached in a microwave, there are various poaching dishes that can be used, such as the triple egg poaching dish shown at the right. The most common error in using a microwave to poach an egg is that it is often overcooked. Use the following procedures to obtain the best results possible using your microwave oven. To begin the process, crack the egg into the dish. 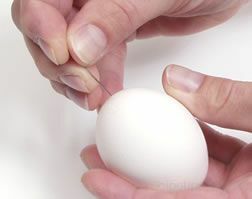 With a toothpick, poke the white and the yolk several times to reduce the tendency for the eggs to burst while cooking. The egg can also burst or explode if the cooking time is too excessive or the heat is too high. Cover the dish securely with a plastic food wrap. 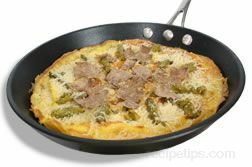 It may be necessary to experiment with various cooking times to achieve the best results, because certain variables, such as the altitude and the wattage of the microwave oven, will affect the cooking time. As a general rule, when cooking only one egg at elevations of 1,000 feet, set the desired cooking time to about 40 seconds for a medium size egg and 45 seconds for a large egg for the first phase of cooking. When cooked on medium power, the egg will have soft consistency. After the first phase of cooking, allow the egg to remain covered in the microwave for 15 seconds; then reset the microwave for 10 to 15 seconds at medium power. Cooking the egg in two phases allows the egg to cook slowly, reducing the possibility of the egg to become overcooked, rubbery, and unappetizing. 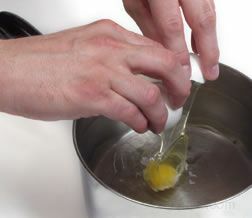 If the egg yolk or egg white explodes during the cooking time, reduce the cooking time the next time an egg is cooked. Also, consider cooking the egg in three phases rather than two, with a decreased amount of time between the first phase and the second phase and a decreased time between the second phase and the third phase (with a short resting period between the first and second phase and the second and third phase). Achieving the desired results can be accomplished by trial and error, doing some testing and watching the egg during the final cooking stage. Since all microwaves differ in cooking power and corresponding temperatures, test the results several different ways to determine the best procedure for the desired results.